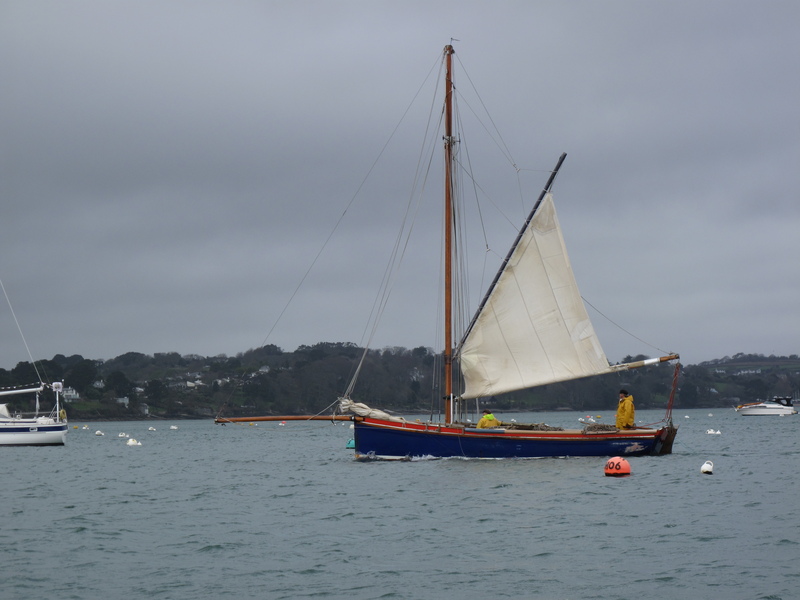 Fowey-Falmouth – Dirty wet dog , boats and sailing. I broke off the cruising log for March halfway through the month and in log terms just as we pulled into Mevagissey. I had intended to write up the crusing log/diary just once a month but it doesn’t really fit with either the way i write my posts or the pattern of the voyage itself. Really what i should have done is a better post just about Fowey and Golant which i really enjoyed aside from making a basic ‘NOOB’ error in a difficult wind over tide situation. I really enjoyed hunting out the channels and then drying out both in the Fowey river and off Golant, i can well imagine that on a nice summers day it would be a really nice thing to go up to Golant and dry out on the clean firm sand and have a walk around : i haven’t been able to do that since one day last year at St Aubyn bay in Jersey during our Brittanny cruise. After our day of double-NOOB errors we did get away from Fowey and had some sailing up into the corner of St Austell bay, anchored off a small inaccessible shingle beach near Gerrans head and then sailed across to the small fishing harbour at Mevagissey : it would have been a great session to film or photograph except that both my main camera and the little video camera were out of battery. The main camera’s battery’s are both dying and i kept forgetting to turn the video camera off so it keeps running out of charge too and i keep forgetting to carry its charging cable and that despite deliberately fitting a switch panel with a USB charger. That meant i didn’t get any pictures at Mevagissey or on the passage next day down past Gorran Haven and around the Dodman. I had wanted to get some shots as we passed inside Gull rock and with the whelps standing clear on a very low spring tide but of course failed on that too. It was a lumpy passage around the Dodman through the overfalls even with hardly any wind, the forecasts have been mainly wrong as it should have been a 3-4 westerly or south-westerly but i recorded it as being northerly and variable at best. It was a cold and dull passage , noisy too as i motored for most of it : we pulled into the beach an Porthscatho for a welcome break and briefly the sun broke through and brought a gentle nor-westerly breeze so it gave us a nice sail out but which headed quickly and with the tide already flooding against us i found it really hard going to get dead upwind and up-tide to St Anthony head and into Falmouth roads. What wind there was just kept heading us all the way into the inner harbour so were glad to slip alongside at the town haven. We didn’t spend long there, it was a busy and noisy night with the pilot launch in and out through the night, big generators running all night and the lights of pendennis shipyard on all night, the boat really isn’t set up for that kind of thing so after shopping and breakfast the next day we moved around to say hello at my new base : Mylor yacht harbour where Tristan the moorings manager said he would set up a mooring for me and we went off upriver for a quiet night (incredibly quiet) in the Fal river upstream of the king Harry ferry. The ‘way’ of the month so far has been mainly in sheltering from gales and waiting for the briefest of weather slots to allow me to go west. Along the way so far i have missed out on several places such as looe, Polperro, Gorran haven and Porthscatho. My plan now though is to be based at Mylor in the Fal river and cruise this part of the west-country from that base. It is early though, only mid March and most boat owners have hardly started their spring refits yet let alone done their first passages of the year. Sometime i will go back to Fowey as a new contact there may have given me a lead on some local boatmen that i would like to cover : my aim being not just to talk about my micro-adventure with this boat but to try and do some genuine photo-journalism about people and places connected with the sea. In Mylor i would love to cover the working sailing shellfish boats, get out on the pilot launch if i can swing it and that’s just on a first look. Great that you’re enjoying being an east coast sailor in the west-country. Looking forward to your tales of people and places as you go about your cruising. Thanks.